Availability: Out of stock. Estimated to ship in 2-5 business days..
Would you take a seat on the Iron Throne? 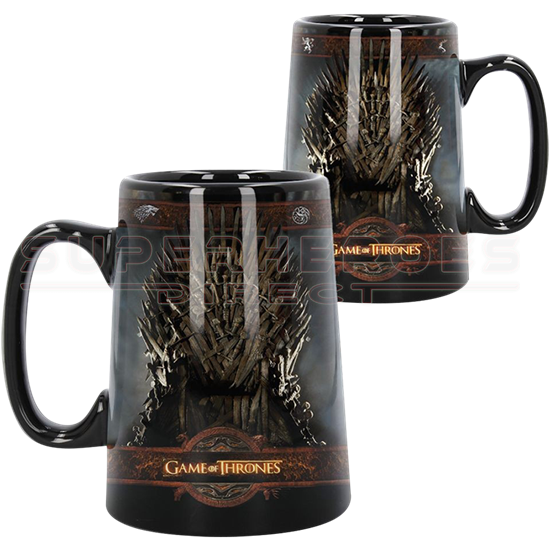 The Game of Thrones Iron Throne Tankard is an officially licensed, food safe collectible ceramic cup featuring a photo-like image of the Westerosi throne made of swords on both of its sides. Above the throne is a band decorated with the sigils of the four great houses, Stark, Targaryen, Lannister, and Baratheon. Beneath the thrones is a wider band with the logo of this hit HBO show. Now you can take the throne of Westeros as easily as drinking your favorite beverage when you add this Game of Thrones tankard to your drinkware collection. This ceramic tankard comes in a box printed with a Game of Thrones map graphic.